﻿﻿﻿Research, partnerships keep Gulf and bays stocked for anglers. ﻿﻿﻿﻿﻿﻿﻿﻿﻿﻿﻿﻿The world’s first red drum hatchery was a public-private partnership. A state agency, a nonprofit conservation group and a utility company came together to make it happen. The Gulf Coast Conservation Association (GCCA) raised $1.4 million to build the facility. Central Power and Light of Corpus Christi offered a construction site at its Barney M. Davis power plant. The Texas Parks and Wildlife Department provided staff and know-how, applying techniques developed at its marine research station in Palacios. What was then known as the John Wilson Marine Fish Hatchery produced its first crop of fingerlings in 1983. Today it’s the CCA Marine Development Center, one of two production hatcheries on the Texas coast. Together, those facilities supply 26 million red drum and spotted seatrout each year for stocking in Texas bay systems. And they still depend on partnerships to keep them moving forward. The GCCA evolved into the Coastal Conservation Association (CCA), a national advocacy group with chapters in 17 states and a long list of accomplishments. But it started here in Texas when a small band of recreational anglers became concerned about overharvest in our coastal fisheries. ﻿Fishing, anyone? TPWD, with corporate and nonprofit help, built hatcheries to stock redfish, flounder and spotted seatrout in bays along the Texas coast. It’s probably fair to say that 50 years ago, most of the fishing public saw the Gulf of Mexico and its associated bay systems as an inexhaustible resource. Texas had a 14-inch minimum length limit on red drum, with no bag limits for commercial or recreational fishing. There were no statewide limits of any kind on spotted seatrout. By the mid-1970s, there were signs of declining populations. Reds in particular appeared to be in serious trouble. The GCCA, led by longtime chairman Walter Fondren III, helped persuade the Texas Legislature to pass the Red Drum Conservation Act of 1977. The act tightened requirements for commercial licenses and set an annual harvest quota. When TPWD proposed new limits for recreational anglers, the group supported those efforts. 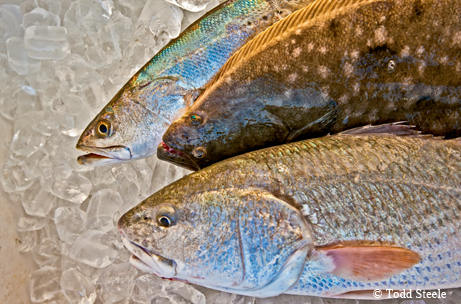 In 1981, the GCCA successfully lobbied to have red drum and spotted seatrout classified as game fish, effectively putting a stop to commercial fishing in state waters. Eventually, commercial harvest of those species was outlawed in federal waters, too. While all this legal activity was going on, scientists at TPWD’s Perry R. Bass Marine Fisheries Research Center and the University of Texas Marine Science Institute were attempting something that hadn’t been done before. Could red drum be reared in captivity and stocked to rebuild wild populations? Pursuing their parallel lines of inquiry, sometimes sharing information, researchers found the sequence of temperature and lighting conditions that would fool reds into spawning in the laboratory. Moving newly hatched larvae into rearing ponds was another challenge; it had to be timed just right. By the early ’80s, all the elements were in place to launch a successful production hatchery. “We developed the technology through research. We developed the hatchery through partnership,” says Gene McCarty, a former deputy executive director of TPWD who served as first hatchery manager for the Corpus Christi site. When the need arose for an additional marine hatchery, a new corporate partner stepped up. Sea Center Texas opened in 1996 on 60 acres of land donated by Dow Chemical Co. in Lake Jackson. Actually, Dow got involved in the 1980s. A couple of extreme winters brought freezing temperatures to Texas bays, killing millions of fish and reminding biologists that it’s never a good idea to put all your eggs in one basket. Dow offered to build some red drum rearing ponds at its Brazosport plant, 150 miles up the coast from Corpus Christi. TPWD stocked the ponds with excess larvae from the CCA hatchery. From 1985 through 1995, more than 45 million fingerlings came out of those four satellite ponds. The success of that effort led to plans for a full-scale hatchery and education center. Once again, the CCA helped raise money for construction. The federal Sport Fish Restoration Program added matching funds. Residents of the City of Lake Jackson approved a bond issue to build a road and bridge to the site. Today, Sea Center occupies 75 acres and attracts more than 60,000 visitors each year. Dow provides water for hatchery operations via a pump station that runs on the plant’s generated electricity. Graduate students from UT’s Marine Science Institute and Texas A&M’s Sea Grant College do research projects at TPWD marine hatcheries, earning academic credit while helping to fine-tune production of red drum, spotted seatrout and, more recently, flounder. CCA’s Texas chapter is still funding research and conservation projects, and TPWD’s Coastal Fisheries Division is still joining forces with old and new partners to make fishing better. For more articles on saltwater fishing, check out TP&W magazine's Saltwater Fishing Page.